What Has Been Updated in the 2019 CDC Vaccine Storage and Handling Toolkit? The CDC Vaccine Storage and Handling Toolkit outlines the best practices for vaccine storage and handling based on Advisory Committee on Immunization Practices (ACIP) guidelines, product information from vaccine manufacturers, and scientific studies. Supporting information, recommendations and resources are included in the Toolkit. For the most part, all the information that was in the 2018 version is still in the 2019 Toolkit, and in the same order and sections, with several small changes throughout. The reduction in length of the Vaccine Storage and Handling Toolkit from 81 pages to 48 pages is primarily due to a more compact font, formatting and Table of Contents. The document layout and many of the graphics have also been redesigned. Vaccine transport information that used to be covered in the “Vaccine Inventory Management” and “Emergency Vaccine Storage and Handling” sections, has been consolidated into the new SECTION SIX: Vaccine Transport. CDC Recommendation – CDC recommends this as a minimal action to protect your vaccine supply. CDC Best Practice – CDC recommends best practices as additional actions, practices, and procedures to enhance protection of your vaccine supply. This section refers to purpose-built vaccine storage units that have been developed specifically for the storage of vaccines. They are often unique in design and can take many forms, from traditional stand-alone type units to dispensing type units. Some of the differences in design of some types of purpose-built units are outlined on this page. Immunization programs determine which purpose-built units meet their VFC program requirements. Note: The TempArmour™ Vaccine Refrigerator is a pharmaceutical-grade, purpose-built refrigerator specifically designed for the effective storage of vaccines. The TempArmour™ Vaccine Carrier is a “Qualified Container and Packout” vaccine transport system. The TempArmour™ Vaccine Refrigerator is a purpose-built refrigerator that arrives with the thermostat setting "factory-set" so that the temperature settles within the optimal range for this refrigerator (3-4.5 °C) to provide the most effective vaccine protection and temperature stability. This lower set point temperature allows the TempArmour™ Refrigerator to maximize its 6 day holdover time during power outages. The lower temperature setting is not a concern for the TempArmour™ refrigerator as its design and technology eliminates the common issues of freezing, cold spots, and temperature spikes. No need to add water bottles to the TempArmour™ Vaccine Refrigerator as effective thermal storage is already integrated into the refrigerator to provide exceptional temperature stability. This section has been updated to address how vaccines should be managed in refrigerators and freezers that have stop operating. As TempArmour™ customers know, the TempArmour™ Vaccine Refrigerator is designed to maintain its temperature for up to six days during a power outage, if accidentally unplugged, or for any other reason its operation is disrupted. In fact the TempArmour™ Refrigerator has proven to be an effective alternative to backup power. The TempArmour™ Vaccine Carrier is an example of a “Qualified Container and Packout” that is specifically engineered for vaccine transport. 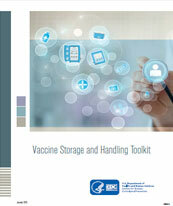 DOWNLOAD THE 2019 VACCINE STORAGE AND HANDLING TOOKIT HERE.